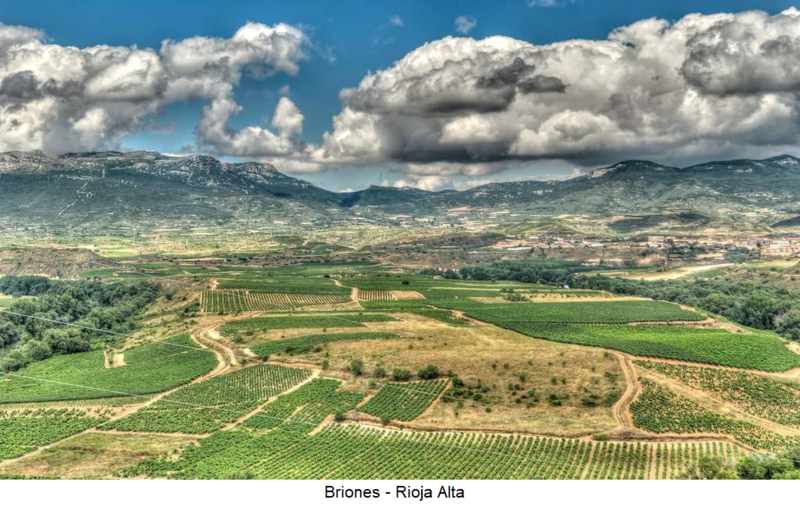 Rioja Alta: The 24,000 hectare zone with the city of Haro as the wine center is located south of the Ebro River and west of the provincial capital Logroño entirely in the province of La Rioja. Under the influence of the Atlantic Ocean, the climate is characterized by hot summers, mild autumns and cool winters. The vineyards lie on deposit floors, mixed with lime and iron-containing alumina. The dominant variety is Tempranillo, followed by Mazuelo and Graciano, which all have slightly thicker and more extractive peel as in the other Rioja areas. Here are the best quality Rioja produced. The full-bodied red wines with a high proportion of acids and tannins are excellently suited for barrel aging and can be stored for a long time. Rioja Alavesa: The 12,000-hectare zone lies to the north of the Ebro River entirely in the Basque country, The climate is similar to that in Rioja Alta, prevail in the vineyards lime clay soils. The dominant grape variety is Tempranillo with a slightly thinner peel. Here predominate light, fruity and spicy red wines with medium alcohol and total acid content. They can be consumed as young wines, but are also suitable for barrel aging. As a rule, they are not as storable as those from Rioja Alta. Rioja Baja: The 20,500-hectare zone east of Logroño extends over two autonomous provinces, namely Navarra (is confusingly also a dedicated DO area) and La Rioja. In this warmest and driest zone, there is a Mediterranean climate with less precipitation. The vineyards are predominantly on iron-containing clays with deposits. The dominant grape variety in this area is the Garnacha Tinta. Here there are extract-rich, alcohol-rich red wines with up to 15% vol alcohol content, as well as rosé wines. The aromatic and often precocious and usually young wines are considered not as noble as those of the other two Rioja areas. The most important Rioja grape variety is Tempranillo, which accounts for nearly 60,000 hectares of nearly 28,000 hectares. The most common white variety is Viura ( Macabeo ) with 8,000 hectares. Around 75% of Rioja is produced as red wine. Not a few do not know that there are other versions, because Rioja is associated mostly with red wine. The rest is with 15% rosé wines and 10% white wines. The "alien" Rioja varieties may not be listed on the bottle label, in contrast to the classic locals. Around 180 million liters of Rioja are produced each year, and one third is exported to 70 countries. The red Rioja is 80% of the main variety Tempranillo with shares of Garnacha Tinta. Graciano and mazuelo, as well as the varieties allowed since the year 2007 Maturana Parda and Maturana Tinta ( Trousseau Noir ) pressed. From the previously customary addition of white wines one has strayed. With a special permit may also be the two varieties Cabernet Sauvignon and Merlot be used. The red wines are almost exclusively dry. The rosé version is also marketed semisweet. The also mostly dry white Rioja is made of Viura ( Macabeo ), Malvasia Riojana ( alarije ) and Garnacha Blanca, and since the 2007 vintage the newly approved varieties Chardonnay. Sauvignon Blanc (together a maximum of 50%), Maturana Blanca. Tempranillo Blanco, Turrunts ( Torrontés ) and Verdejo vinified. The old custom, the bottles with the traditional gold-colored wire mesh Alambrado to wrap around, is practiced only partially today. Joven (Young): (Young = Young wine): The young Rioja (in white, red and rosé) bears only the name "Garantia de Origen" and comes on the market a few months after the harvest. But he can also be matured in oak barrels or expanded. These ready to drink wines are young to enjoy. The production share is 40%. Crianza (Ripened): Red wines have to mature for at least two years, of which at least one year in the barrel and the rest in the bottle. For rosé and white wines, six months are sufficient. The production rate is 40%. Reserva : Red wines have to be aged for three years, of which at least one year in the barrel and the rest of the time in the bottle. For white wines are two years with at least six months in barrel. Rosados ​​(rosé wines) is not available as a Reserva or Gran Riserva. The production share is around 15%. Gran Reserva: Red wines must be aged five years, of which at least two years in the barrel and up to three years in the bottle. Some bodegas produce long-lived white wines that age at least six months in the barrel and 42 months in the bottle. The production share is only 3%. Village and Region : In addition to the maturity-defined quality levels Joven, Crianza, Reserva and Gran Reserva, these two origin-oriented categories have been in existence since the 2017 vintage. Vino de Autor: Unofficial name (dt. Author's wine) for wines of special quality, which are produced in particularly good vintages from selected grapes in limited quantities. Above all, this is practiced by smaller companies, especially in the area of ​​Rioja Alavesa, which is thus the trend of the so-called Garage wines consequences. These mostly very expensive wines are marketed with bottle prices up to € 200. This page was last modified at 5 September 2017 at 10:38.